SAVE THE DATE: TN LIBRARY LEGISLATIVE DAY 2020! Blake Hopper, Jennifer Sharp, and Lindsey Kimery with Senator Frank Nicely, who signed a letter to Governor Lee in support of a state coordinator. Jennifer Sharp, Blake Hopper, Lindsey Kimery with Representative Vincent Dixie who signed a letter to Governor Lee in support of a state coordinator. 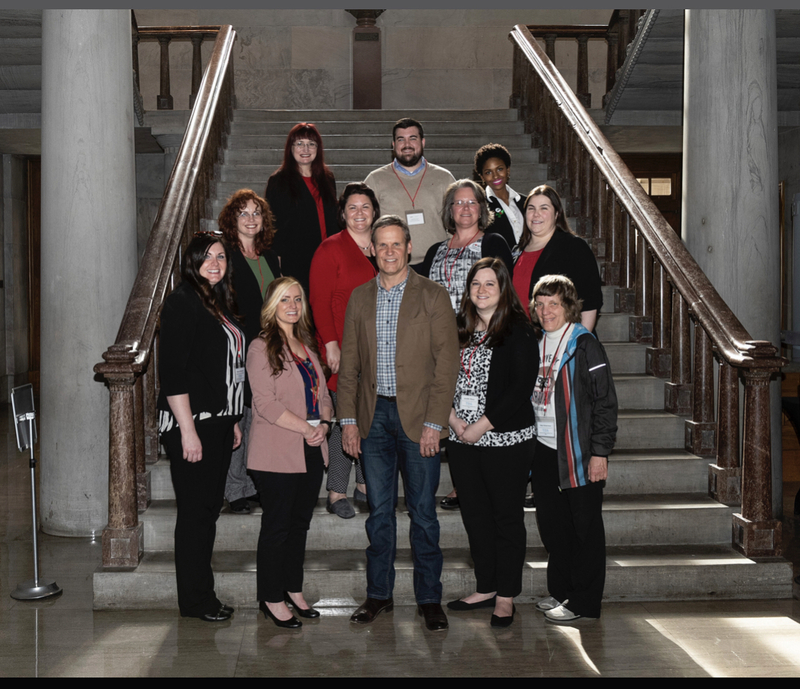 We had more school librarians in attendance this year, and we continued our mission of sharing the value of school libraries and librarians in Tennessee, and asking legislators to support the appointment of a State Coordinator of School Library Services to the Department of Education. Thank you to Senator Jack Johnson, Senator Frank Nicely, and Representative Vincent Dixie for signing letters of support asking Governor Lee to include funding for this position in his fiscal year 2020 budget! 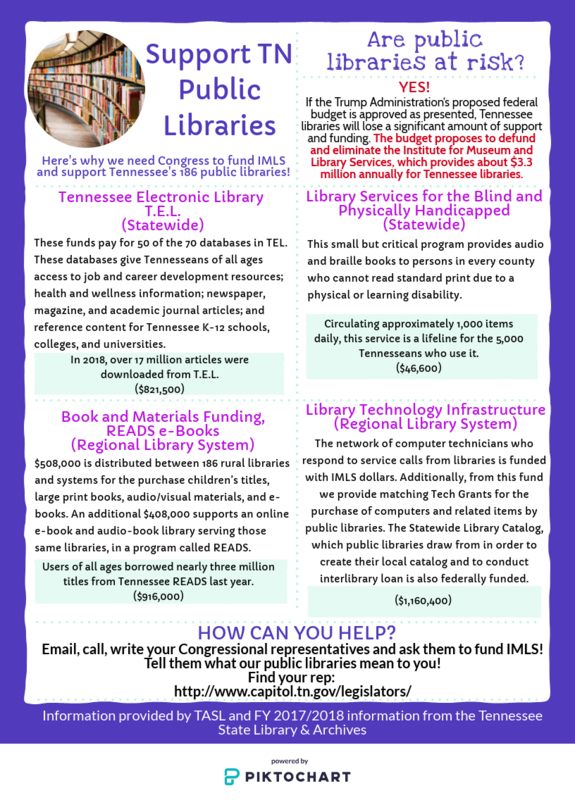 Data provided by State Librarian and Archivist, Chuck Sherrill, about how IMLS funding is utilized in Tennessee) In addition to our ask, please contact your legislators to ask them to fund IMLS. The president’s budget currently eliminates and defunds the Institute of Museum and Library Services, which provides $3.3 million annually to Tennessee libraries. Our legislators need to hear how important resources, like TEL, which are provided by the state, are to your school. Chances are, if TEL was eliminated, TN schools could not individually afford to fund this level of database access for their students. 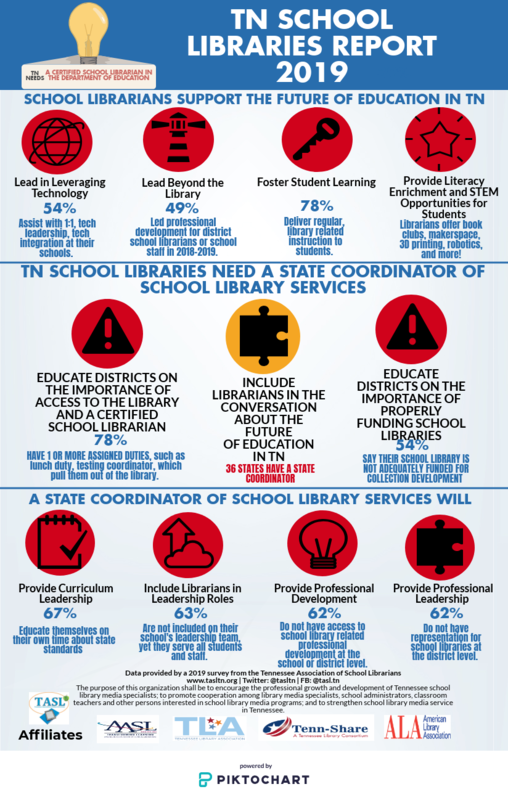 Contact your legislators and ask them to appoint a State Coordinator of School Library Services to the Tennessee Department of Education and ask them to fund IMLS. The passage of ESSA (Every Student Succeeds Act) was great news for school libraries. Now it's time to take advantage of the opportunities it provides. AASL has shared the following information. Check it out! Looking for a tool to quickly and effectively show the impact made by your library? Check out AASL's School Library Snapshot Tool. The Snapshot is aligned to provisions in the Every Student Succeeds Act (ESSA). Be sure to share your snapshot! Advocacy isn't only about contacting legislators and policy makers. It's about being sure that all stakeholders know just how valuable a strong school library program is. Here are some tools to help with your Everyday Advocacy efforts. AASL has a Toolkit to get you started or inspire you with some new ideas. Check out AASL's advocacy page for even more information. The Tennessee Library Association actively monitors state legislation related to libraries, librarians, school media specialists, reading, copyright, and intellectual freedom. Also, locate your elected officials. The Pennsylvania School Library Project has a wealth of information. This valuable tool will help further your advocacy efforts.Here's the link: http://paschoollibraryproject.org/home.